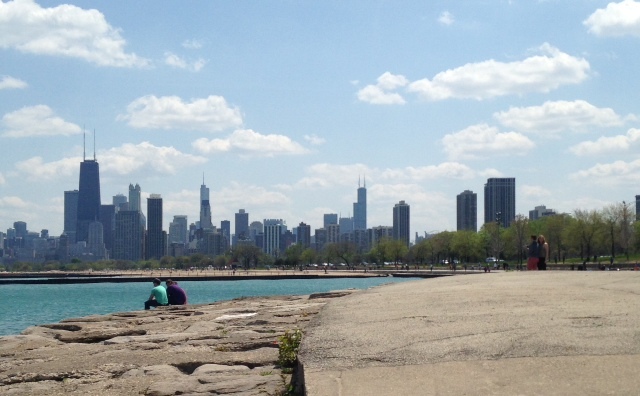 With another six hours on our hands before departing Chicago, I decided we needed to fulfill the final two food stops on our list so we headed for Lincoln Park. Soon, we were sharing a train car with a host of red, white and rowdy Cubs fans on their way to Wrigley. Good times. Our first stop was the The Bourgeois Pig for a chicken parm panini and a ginger molasses cookie to share on the shore of Lake Michigan. We sat there for a good hour, admiring what a gorgeous day it turned out to be. In front of us, a swarm of sailboats peppered the water. Behind us, a group appeared to be doing tai chi on the grass. Plenty of people were sunbathing. And there was no shortage of runners along Lakeshore Beach. But we weren’t done dining. Our next and last food stop was The Purple Pig on the Magnificent Mile. The Mediterranean spot came highly recommended so we made our way there for Second Lunch, hoping our off-hours arrival time would thwart the usually long waits we’d heard about. It worked. It wasn’t long before we were sampling the charred cauliflower with toasted breadcrumbs, cornichons and parsley. The pork neck bone gravy with ricotta. 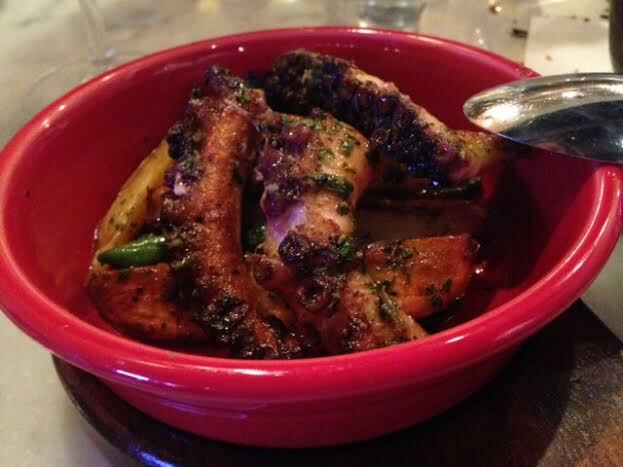 The octopus a la plancha with green beans, fingerling potatoes and salsa verde. And the chorizo-stuffed olives. Until next time, Chicago. Hogs and kisses. The morning after taking in a Haim show at the Riviera Theater in Uptown, the girls and I strolled through parts of the 25-acre urban space on the north end of Grant Park known as Millennium Park. The last time I saw this place was on a weekend jaunt from NYC for Lollapalooza in 2007. Daft Punk. Muse. Black Keys. Pearl Jam. Things haven’t changed much on the festival circuit, eh? 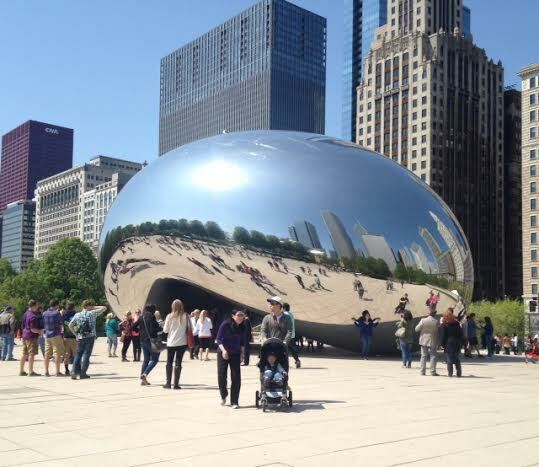 After admiring the amphitheater and the cancer survivors garden, our last stop inside the park was “The Bean.” The mirror-like sculpture is made of stainless steel that reflects the city’s skyline. With that, the essential Chicago photo op was complete, and we had to say adios to half our foursome. A visit to the John Hancock Center, or “Big John,” was in order on our second afternoon in Chicago, so after we disembarked from “Chicago’s First Lady,” we booked it to The Signature Room. More accurately, we stood in line for 30 minutes to get into an elevator that would take us to The Signature Room on the 95th floor. The 360-degree views, we heard, were worth crowding into said elevator with 22 other tourists at a time. Ahem. They WERE, guys. This photo was taken from the women’s bathroom. You read that right. Floor-to-ceiling windows with sweeping views of four states will make you forget what you went in there for. And you know what didn’t hurt? The smoked duck nachos with melted Gouda and verde sauce in the lounge didn’t hurt. 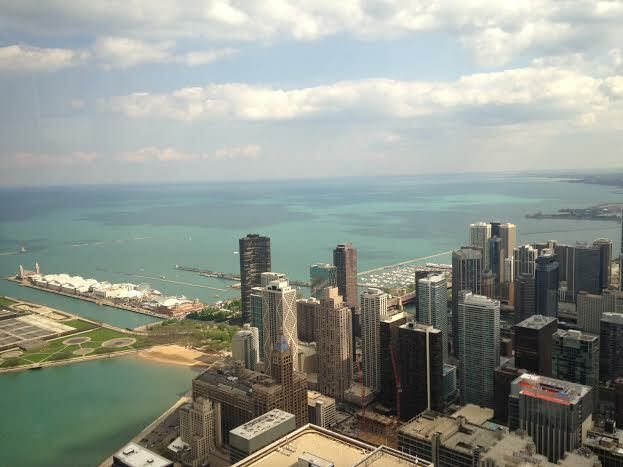 Sure, this place is totally overrun by tourists, but it was certainly worth a peek at Lake Michigan from above. Before we left for Chicago, everyone we knew shook us violently and said, “YOU MUST GO AN AN ARCHITECTURE TOUR. BOOK IT TO THE BOAT OR I’LL NEVER SPEAK TO YOU AGAIN.” We got the message, guys. After a mimosa brunch Saturday morning, we walked up Michigan Avenue toward “Chicago’s First Lady,” a riverboat cruise offered by the Chicago Architecture Foundation. The 90-minute tour along the Chicago River was unreal. As we sat surrounded by skyscrapers, I started to understand why multiple friends demanded that we make time for this fabulous floating history lesson. 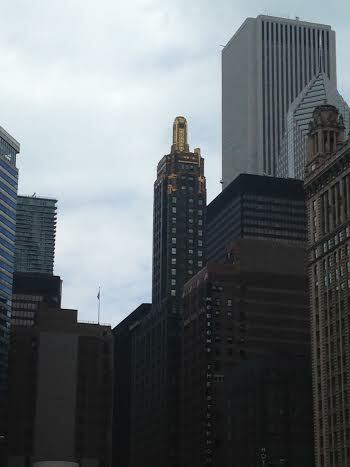 The gilded art deco buidling shown in the center of this photo is the Hard Rock Hotel, built in 1929. She is said to have been designed to look like a champagne bottle (at the height of Prohibition). The exterior metal you see at the top there is actually 24-karat gold leaf. I hear she’s a total diva. They say that when your body craves certain foods, it might be trying to tell you something. A craving could be a window into your nutritional needs, so to speak. That said, this girl must need more iron in her life stat because I managed to devour a lox brunch for exactly three days in a row while visiting Chicago last weekend. Omega-3 fatty acids were all up in my business. I blame the Eleven City Diner. Our foursome visited this spot in South Loop on a tip from a doorman, and were immediately impressed with the charming Jewish deli. At right is a shot of my carefully plated Lox & Latke. 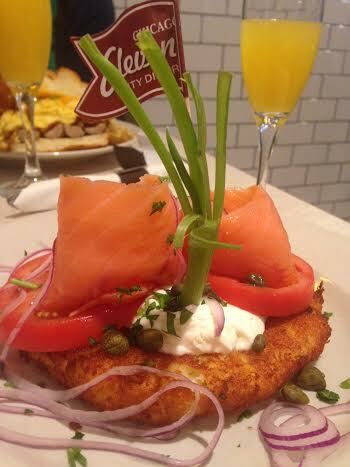 A potato latke, Nova lox, green onions, capers and a dollop of sour cream smiled sweetly at me. Yes, I will have this dance. Last weekend, I got to meet up with a few former colleagues and fabulous friends in Chicago for a weekend of culture and good eats. Since a couple of us arrived early, and were met with disappointingly cold and rainy weather, we booked it down to the Art Institute of Chicago for a look at the impressionist and post-impressionist art. 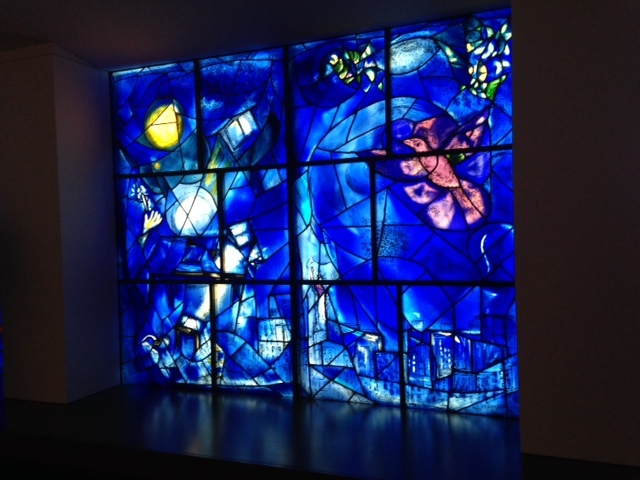 The first thing I was drawn to was Marc Chagall’s “America Windows,” which debuted at the Institute in ’77. I learned that the piece was created to commemorate America’s bicentennial and celebrate the cultural and religious freedom of America. Although this shot only captures one of the six panels featured, the work as a whole details arts, music, painting, literature, theater and dance. 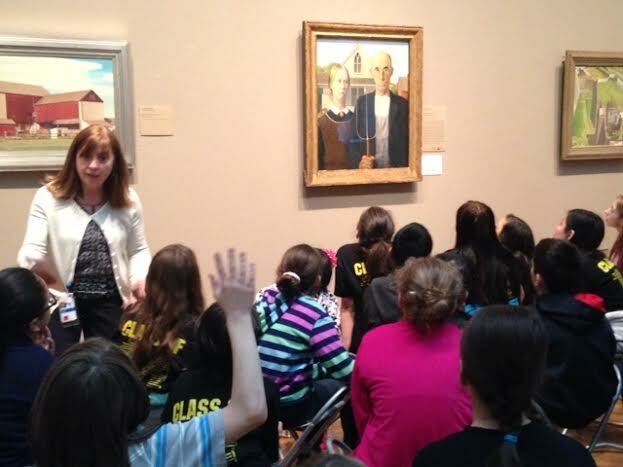 A few floors of art later, I found group of engrossed 5th-graders staring at Grant Wood’s “American Gothic” and eavesdropped on a few minutes of their Depression-era art history lesson. “Do you think they look happy or sad?” the teacher asked. “Tired.” One kid offered. Very astute, young man. Post-museum, we stopped in for a snack at the historic Gage Hotel (built in 1890) on Michigan Avenue. On the table: A trio of seared Nantucket sea scallops with a Korean barbecue short rib and kimchi. Unfortunately, I was so busy devouring my share, that I didn’t even think to take a photo of the little beauties. Forgive me. A little nap later, and our foursome was complete. Nashville, Chapel Hill and Austin were all united in Chicago just in time for dinner. 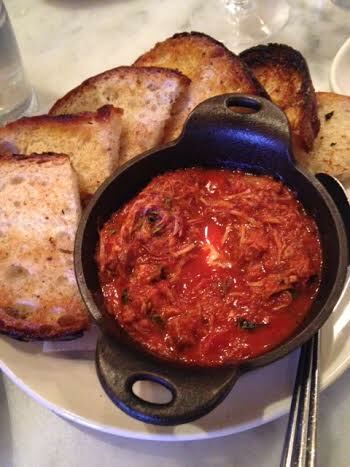 We dined at the highly recommended Topo Gigio, a phenomenal Italian joint in Old Town. I opted for my go-to shellfish dish. This time, it was the spaghetti ai frutti di mare, featuring calamari, mussels, clams and scallops in a lovely red sauce. The Second City was our last stop of the night. The improv club is well known for dozens of alums who went on to appear on “Saturday Night Live.” Catching one of their shows was a must, according to friends who raved about the endlessly witty sketches. As expected, hilarity ensued at The 38th Revue. Upon arrival in Chicago last weekend, my friend and I were greeted by disappointingly freezing temps. I’m talkin’ about a below-40, wind-slapped kinda wake-up call. It was a book-it-to-Walgreens-for-gloves kinda greeting, y’all. There was snow just outside the Greater Chicago area and these Texans weren’t even wearing socks! (Rookies. I know.) “But it’s May!” we kept telling each other, as if Mother Nature might hear us and change her mind. 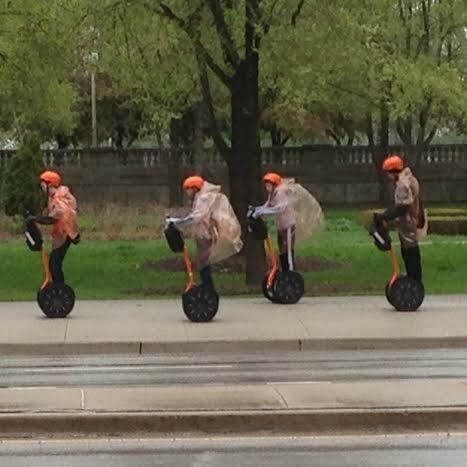 As we walked the 8 blocks the from the train station to our hotel in the biting drizzle, you can imagine our surprise upon seeing these four crazies rockin’ it out on a Segway tour. I looked at my hand, numb from pulling my luggage sans glove, and shrugged. If they could find a way to enjoy a grey Chicago day, then so could we.